Mickey Mouse, sometimes titled Mickey Mouse and Friends, is a comic book series first published in 1941 as part of the Four Color one-shot series and was most recently published by Boom! Studios under its Boom! Kids imprint. The book focuses on stories with Mickey and his supporting cast: Goofy, Donald Duck, Minnie Mouse, Pluto and Mickey’s nephews Morty and Ferdie Fieldmouse. The above is the cover of Mickey Mouse and Friends #296 issued in September of 2009. 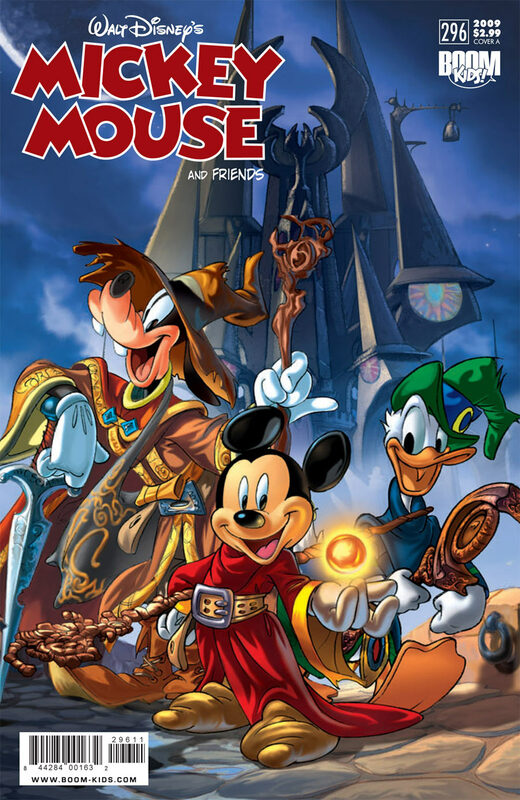 The book title in the cover features “Mickey Mouse” in all capitals in cartoon lettering, with each letter outlined with a white border. These letters are probably hand lettered and are not available as a font. There are, however, some commercial fonts that are similar to the lettering, such as Xavier Sans Bold designed by Jason Castle, Aarde Black designed by Anton Scholtz. There are also some free fonts available resembling the lettering such as the Mickey font, the Mickey Ears font. The Mickey font is probably the closest to the original lettering and it is available in two variants: the Mickey (solid letters) and the Minnie (hollow letters). Mickey Ears is another font that mimics the lettering and the main difference is that each letter is put inside the silhouette of the head and ears of Mickey Mouse. You can download Mickey Ears font here. If you do not want to download and install the font but just like to create simple text or logos using Mickey Mouse Font, just use the text generator below. The following tool will convert your entered text into images using Mickey Mouse Font, and then you can right-click on the image to save it or click on the "EMBED" button to get links to embed images on the web.